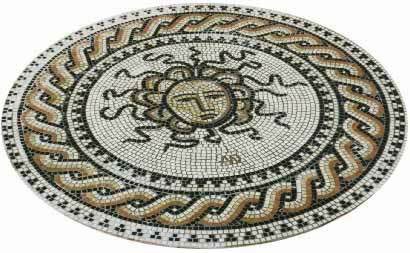 See how we made our mosaic and Roman garden. Enjoy the beauty of Latin poetry - even if you know no Latin! Powerpoint on SCANSION - this is an attempt to explain the metre and rhythms of Latin poetry in a way that non-specialists can understand. You will also need to download this sound file and save it in a folder with the powerpoint so that it will play when you reach the relevant slide. - and listen to Boris Johnson's message! If you are interested in the roots of English words you may enjoy the Classical Computers Quiz , Classical Face Quiz and the Harry Potter Quiz which show you the Classical derivations clearly. Translate Roman inscriptions - including luggage labels! Discover how to translate tombstone inscriptions. Find out how the Latin language works. Students of Latin, Greek and Classical Civilisation will find a selection of pages especially for them on the 'Meet Pyrrha' page. You can visit Roman forts, amphitheatres and a Celtic hillfort and examine evidence for how Roman soldiers lived by clicking on the 'inscriptions' section, which also explores Roman religious ideas. This Website has been given the Perseus Award for 'helping to spread information about the Classical World'.